Here are some screenshots of the current user interface. 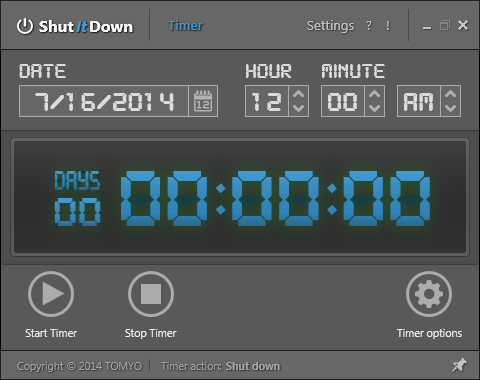 Download the current version of ShutItDown (freeware). Available as complete version (with installation), or as zipped version (without installer, e.g. for portable usage). French translation for ShutItDown (friendly translated by Max). NEW !!! Hungarian translation for ShutItDown (friendly translated by videotanfolyam.hu). Just copy the translation file (*.xml) to the 'Languages' folder included in the installation directory of ShutItDown. The Microsoft .NET 4 Framework must be installed to run ShutItDown.